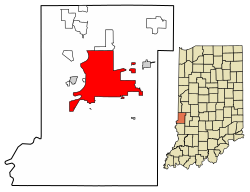 "Queen City of the Wabash"
"Capital of the Wabash Valley"
Location of Terre Haute in Vigo County, Indiana. Terre Haute is a city of Indiana in the United States. Indiana State University is in Terre Haute. ↑ "The Office of the Mayor – City of Terre Haute, IN". Terrehaute.in.gov. Retrieved 2013-01-31. ↑ "US Board on Geographic Names". United States Geological Survey. October 25, 2007. Retrieved 2016-07-13. ↑ "U.S. Census Bureau QuickFacts: Terre Haute city, Indiana". www.census.gov.